Do you believe in fairies? I don’t. At least not those dragonfly-winged, petulant mini-Barbies in foxglove hats and daisy-petal tutus that the word immediately conjures up. But recently, on a day when I couldn’t say that the sun don’t shine, I let my niece Polly take me by the hand and lead me through the streets of London, and she showed me something that made me change my mind. “Ooooh, book fairies!” exclaimed Polly. She explained that a few years ago, books had started to appear magically on the London Underground. They would be, as this one was, nicely gift-wrapped and left on a seat or perched on a windowsill. People started following the instructions, reading the books, and leaving them about for the next person to enjoy, and becoming book fairies themselves. Soon, books were leaving the city on trains and spreading their message across the country. Other cities and towns caught on, and books started to appear in airports, hitching a ride across the ocean and hopping off at new destinations. The idea originated with a young woman going by the marvellously literary name, Cordelia. She is the Chief Book Fairy and, like all the others in the group, goes by just the one name, since this network values anonymity and is fuelled by the kindness of strangers. All I could find out about her was that her father (presumably not Lear) runs an independent bookshop in Hampshire, and passed on his love of reading — and, more importantly, sharing — books to his daughter. Starting ‘The Book Fairies’ was, she says, “simply an extension of that”. Now, the book fairies — over 9,000 across 100 countries — are quietly working their magic. There are Indian book fairies in Kolkata, Chennai, Delhi and Mumbai as well as Bengaluru, Goa, Hyderabad, Amritsar and Chandigarh. How is this free and open exchange financed? Like most grassroots social movements, it relies heavily on the internet and runs on a wing and a prayer. The only income (as far as I could tell) into Fairyland Central comes from the sale of merchandise: bookmarks, ribbons, and stickers as well as ‘I believe in book fairies’ tote bags, badges and pins. The fairies’ Facebook page is just about the cheeriest, least trollable, most rainbow-and-unicorns-inducing corner of the internet, with posts about delighted readers serendipitously discovering a new author or novel. The Language of Kindness by Christie Watson was discovered in London, read on the Eurostar to Paris, and left at Notre Dame cathedral by a young woman who says, “I enjoyed it so much and it had such a huge impact on me and I just couldn’t keep it to myself.” Catch-22 was caught sight of, quite possibly 22 times, in a café in Bengaluru. A book by the anthropologist and explorer-in-residence for National Geographic (how’s that for a job title?) was left in four cities across Colombia to celebrate International Book Fairy Day (of course, there is one) on June 24. The Book Fairy of Amritsar held an impromptu storytelling session for local children of all ages — which, this being India, also morphed into a small career counselling session. But my favourite story about book fairies was shared with me by my niece as we walked through the sunshine, a gift from the fairies of London — Åsne Seierstad’s The Bookseller of Kabul — tucked under my arm. Polly was sitting in the Tube one day and noticed a beribboned book left on a seat. The title caught her eye: Lean on Pete. Given that her partner’s name is Pete and she was feeling low that day, it seemed like it was meant precisely for her, for that very moment, with uncanny intent. It is often said that books find their way to their ideal reader, and on that day, the book appeared to Polly like an unspoken wish had been magically, mysteriously granted. Across cultures, there are stories about fairies, pixies, elves or imps, or what are simply called the little people. They carry on their lives, just below our line of sight. Rarely glimpsed, yet whose presence can be traced — like a trail of breadcrumbs — leading from the fantasyland of the imagination back to our quotidian lives. 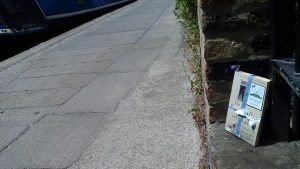 Book fairies operate the ultimate lending library: no buildings, just an invisible web of shelves that stretches around the globe. Run by Amatullah in Kenya, Doris in Japan, Leslie in Mexico, Namita in Bengaluru, Lidja in Serbia, Kadambari in Mumbai, Athulya in Hyderabad, you, me, Polly, Cordelia and all the little people are subtly undermining the brutal economics of the publishing industry with random acts of kindness. You can join them at ibelieveinbookfairies.com.